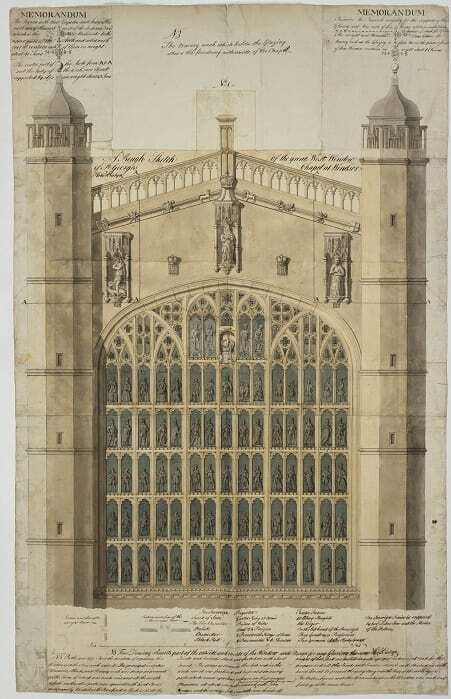 This plan of the west front of St George’s Chapel dates from the late eighteenth century and is one of many designs produced for St George’s by Henry Emlyn. Emlyn was a local carpenter who, during the reign of George III, became responsible for overseeing an extensive programme of refurbishment within the Chapel. His plans and drawings in the Archives range in scale from this depiction of the full west front to designs for the smallest details of the wood carving inside the Chapel. As well as his architectural drawings, the Archives holds a set of his drawing instruments and a number of the financial accounts for the works he carried out in the Chapel. At first glance, this drawing of the west window looks much as we know it today. Elaborate tracery marks out 79 lights, each filled with a figure. Emlyn’s notes on the plan state that in 1777 he was directed to repair the window and the stone work surrounding it, which was decayed in several places. He replaced some of the broken stone- and iron-work with new and made repairs in other places so there were no more visible defects. Emlyn’s alterations were not purely aesthetic, but also made sure that weight of the stone and iron, which had been putting extraordinary pressure on the principal mullions of the window, was more evenly distributed. On close inspection, the design for the window itself is not the glass which we know today. The figures that Emlyn has etched into the lights represent the Garter Day parade at Windsor: the king appears in the top central light, his mantle carried by pages to the right; to the left are the officers of the Order, including the Dean of Windsor as Register of the Order of the Garter in the second light from the left. In the lower tiers are the Knights of the Garter, their hats crowned with distinctive ostrich feathers and their names inscribed beneath them; then the heralds in their tabards; the Canons of Windsor; the Poor Knights of Windsor; and at the very front of this procession walks the Virger. This design by Emlyn for a Garter-themed west window – perhaps in recognition of the financial contributions made by members of the Order to the ongoing restoration work – is one of two known designs for replacing the west window glass that were never realised. The other being Benjamin West’s and Charles Forrest’s 1796 design for a painted-glass crucifixion scene. In place of either of these eighteenth-century innovations, the west window of St George’s Chapel today retains much of the Tudor glass designed for it; the only window in St George’s to do so. With its assembly of kings, knights, archbishops, popes and saints it is remarkably fortunate to have survived not only this Georgian fervour for modernising the Chapel but also the Parliamentarian occupation of Windsor Castle during the Civil War and Commonwealth and the threat of bombing during the Second World War. At the latter time, the glass was removed from the windows and stored in the Curfew Tower as a precautionary measure, but St George’s survived unscathed.